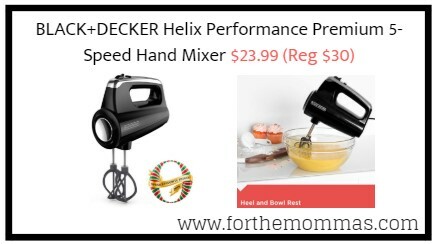 Amazon has BLACK+DECKER Helix Performance Premium 5-Speed Hand Mixer for $23.99 (Reg $30) with FREE Shipping on orders over $25.00 or with Amazon Prime Orders. The BLACK+DECKER Helix Performance Premium Hand Mixer features reinforced nylon beaters with 2x the surface area and 2x the mixing performance. The 250-watt motor runs at five speeds, including a more controlled starting speed to help prevent splatters. Plus, a special turbo boost adds a power boost at every mixing speed to combine thick ingredients in no time. This set includes two helix beaters, two dough hooks, and one wire whisk.